Whisk all the dry ingredients. Combine all the wet ingredients together and mix into the dry ingredients using the dough attachment of a food processor. Turn dough out into a well-oiled glass bowl and cover in a warm place for two hours. Pat dough out onto a heavily floured surface because the dough is very sticky. With floured hands, pat the dough out to a square (about 1/2 inch thickness) piece. Spread preserve over the dough leaving about an inch all the way around free of preserve. Roll up like a Swiss roll and cut 12 even rolls. Place on a prepared 12" by 12" round tart pan or similar. Allow to rest a further 40 minutes. Brush the top generously with melted butter and apricot preserve. Bake for 20 to 30 minutes or until rolls are baked and golden brown. 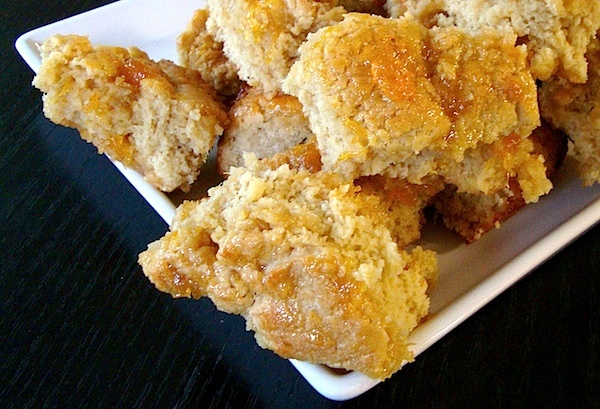 I love pull-apart breads and this sounds delicious!